You Instead (2011) is a low budget rom-com directed by David Mackenzie and starring Attack the Block’s (2011) Luke Treadaway, Natalia Tena, Mathew Baynton and Alastair Mackenzie. 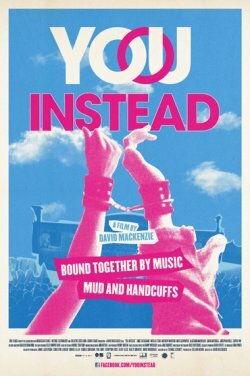 The film is set during the T in the Park festival in July 2010, and clearly aims to add some British grit to what is usually a relatively polished genre. Adam (Treadaway) is one half of a successful indie band whilst Morello (Tena) is the lead singer of an up-and-coming all girl punk band, both of whom are booked to play the festival. The two clash almost immediately and just as their argument begins to escalate an odd man appears who handcuffs the pair together. The stranger then makes a swift exit, leaving the feuding rockers to work out their differences and perhaps even fall in love. You Instead is released one week after Friends with Benefits (2011) and it is extremely difficult to avoid a comparison. The first has all the appearance of an intelligent and independently spirited romantic comedy but possesses little substance, whilst the latter’s glossy exterior masks a sharp wit and satirical edge. Mackenzie does not devote sufficient time or care to the development of the couples’ relationship, but instead chooses to distract the audience with endless shots of the festival, thereby removing them from the situation. Whilst the occasional documentary shot adds a sense of authenticity to a genre which is so often left wanting, these diversions quickly become irritating. Another key problem with the film is its strategic adherence to genre cliches, made all the more disappointing for their poor implementation and lack of creativity. For instance, the opening ‘meet-cute’ is ridiculously contrived and is coupled with a rushed and heavy-handed execution which proves incredibly hard to digest. The mechanical plotting of the film is not only uninspired and predictable, but also makes little emotional or logical sense. In particular, a forced third act confrontation seems to occur solely to enable an impassioned climactic declaration. Having discussed its flaws at length, it would be cruel to fail to acknowledge the positive aspects which the film has to offer. There is a vitality underlying the style of You Instead, as its vibrant documentary sequences and wild character parties successfully immerse the audience in the fun filled festival atmosphere, causing even the most studious to long for summer. The biggest draw though comes in the form of the utterly convincing Treadaway, who manages to succeed even when spouting the cheesiest of lines by maintaining a consistent and naturalistic performance throughout. You Instead is peppered with delicate moments of tenderness but ultimately fails as a romantic comedy due to a severely underdeveloped central relationship, clumsy dialogue and a mechanic adherence to genre cliche.